As I begin to kit out my mobile workshop for the project, I am breaking off to make notes about how to organise and carry out my expedition to Isle Martin. A wonderfully exciting prospect especially with the aim to tow the litter away from the island on World Environment Day. 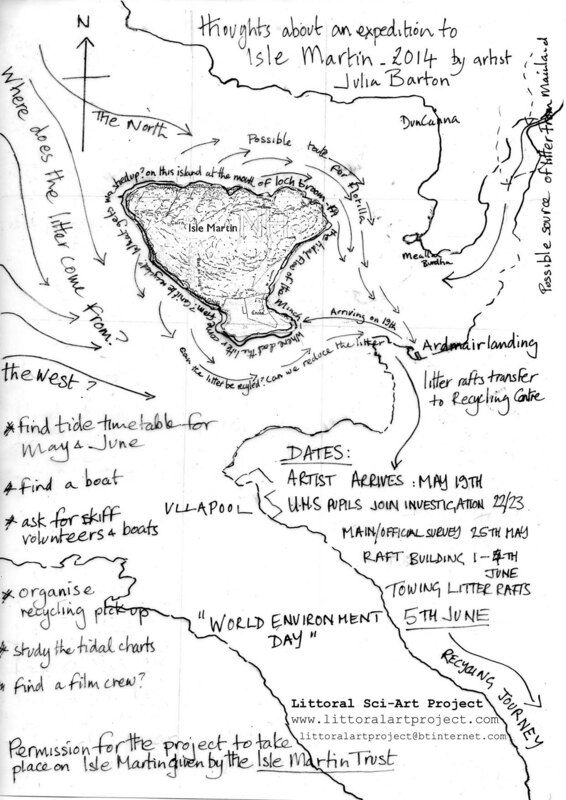 If anyone in the area has access to a boat and time on the 5th June (its a Wednesday) to help tow the ‘Litter Rafts’ to the mainland your support would be much appreciated and would help to make a big visual statement of what it’s possible to achieve. I am also looking for help/funding to film the ‘flotilla event’ on the 5th so that our event on the west coast can be seen on line as part of the United Nations Environment Programme ( UNEP) record of the 2014 World Environment Day events, they are looking for films to show case what can be achieved! Please contact me with any suggestions. Many thanks.